The family that eats together, stays together. Now that a New Year is dawning, 2OX aims to encourage familial dining with the introduction of its Weekend Brunch. Channelling the charming, minimalist chic of Parisian-cafes, 2OX is the sister resto of Maison Francaise - an informal yet stylish French bistro with a skylight, shiny white tiled walls and rustic timber flooring. Priced at RM120++ per person, Executive Chef Lescouezec Florent shows his prowess with a 3-course set menu of refined Euro-French brunch fare every Saturday and Sunday, from 11am till 3pm. 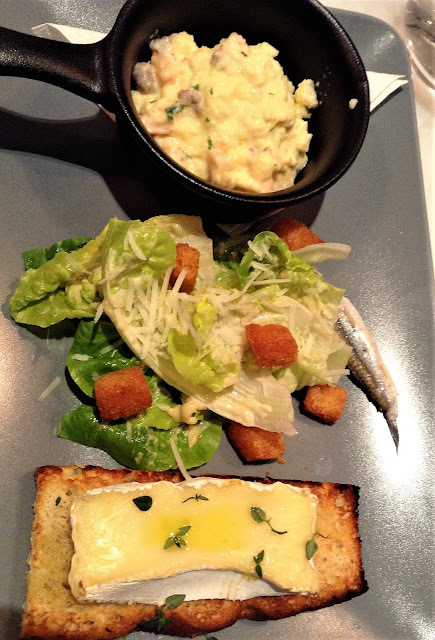 Much to our delight and surprise, the opening volley comprised a triumvirate of hearty French starters: Chopped Caesar Salad (centre), a mini skillet of Scrambled Eggs with Salmon & Fine Herbs (left), and Focaccia with Melted Brie & Green Apples (right). A fleshy anchovy lent a hint of brininess to the dainty mound of savoury dressed lettuce, jazzed up with crunchy cubes of croutons and grated cheese. The fresh green crunchiness was a nice textural contrast to the fluffy, custardy soft eggs which had bits of salmon in it. True to the French culinary essence, the simplest offering of focaccia toast with a generous slice of slightly melty brie atop sliced green apple was the day's stunner. A choice of three roasts: lamb, salmon or beef is yours for the picking when it comes to the main course. After sampling the available options, the consensus flocked to the superbly tender, juicy Roast Lamb. The on-point doneness, when complemented by house made Yorkshire pudding, coleslaw, mashed potato and green beans, instantly won our hearts and minds. Coming in neck-to-neck was Roast Beef. Accompanied by the same supporting sides, the roast was distinctly hearty and should leave no room for complaint. Personally, I found it a tad heavy but hubby had no such qualms so that itself was a positive sign. Fishing for an alternative? Then you'd fall hook, line and sinker for the Roast Salmon. We expected the dish to be up to scratch and naturally, we weren't disappointed. Cooked on the outside with a translucent pink core, the slab of salmon was ship-shape in the taste department. Fresh banana and caramel formed a winning combo for the dessert option of Sticky Toffee Banana Cake with Butterscotch Sauce. Chopped walnuts added crunch to the cake, making this an irresistible choice for those who like old-school cakes made with TLC. Sheer indulgence aptly described the second confection of Crème Brûlée French Toast with Candied Walnuts, Roasted Apple & Whipped Cream. A wickedly decadent dessert to jettison one's dietary resolve but we suggest sharing this to ease up on the guilt factor. Breads and pastries are something the French take seriously. Hence the Baker's Basket should please morning peeps who simply cannot forgo their daily bread. The feather-light, flaky mini croissant, scone and chocolate pastry served with a pat of butter and fruit preserve were manna for the soul when savoured in the company of family and loved ones. For reservations, please call 2OX at tel: 03-2692 2233. Address: 56G, Jalan Doraisamy, Kuala Lumpur.